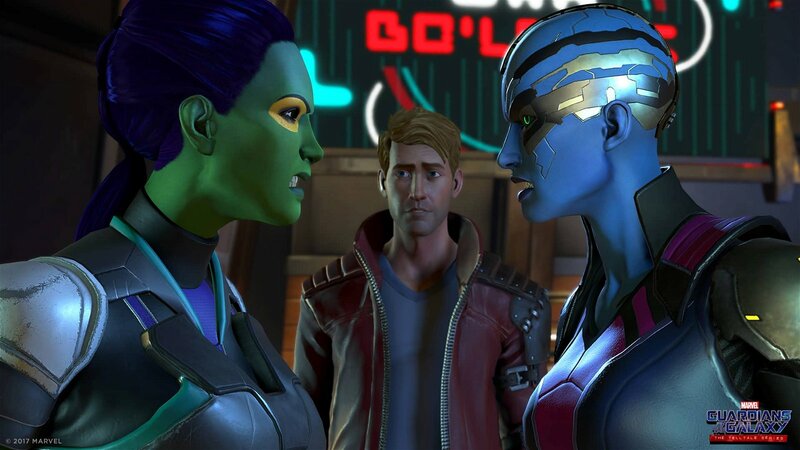 Having played and reviewed Telltale games for so many years now, I’ve come to expect a certain baseline of clarity from the studio’s writing and decisions, and after three episodes in a row Guardians of the Galaxy has made me feel like I can’t even count on that. At the beginning of several of Telltale’s series, the studio makes it clear that in the midst of its dialogue options “silence is a valid option”. Yet, in Guardians’ third episode, More Than a Feeling, I found that if I was opting for silence, the game would put words in my mouth—or a fist into my enemy’s face. The first scene from More Than a Feeling was a flashback to Peter Quill’s childhood, one where a bully mentioned in a previous episode popped back into his life to try and intimidate him and insult his mother for her illness. Earlier, during a conversation with Peter’s mother I promised that if I ended up an adversarial situation again, I wouldn’t get into a physical altercation. So I did what Telltale told me I could do and remained silent. I knew if I didn’t let him antagonize me an adult would come back into the room and I could keep my promise to Peter’s mom. However, by choosing silence when the decision to hit the bully was on my screen, the game took over and Peter threw the first punch. I was stunned, and immediately quit the episode to start over. 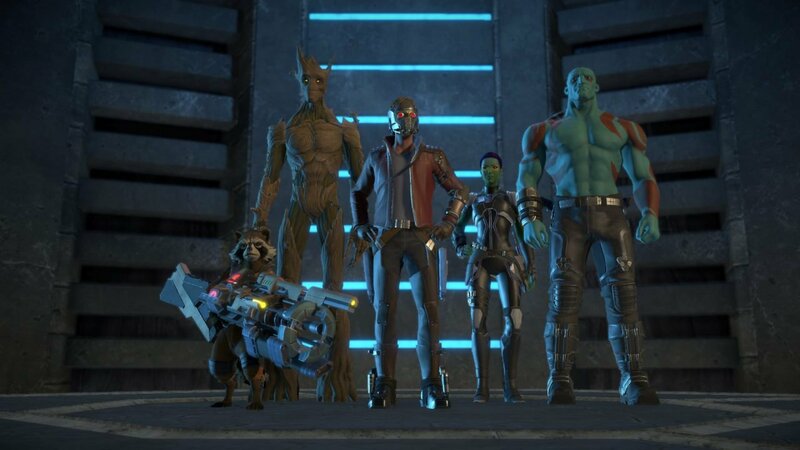 As I mentioned in my reviews for previous episodes Under Pressure and Tangled Up in Blue, Guardians of the Galaxy has repeatedly shown a disconnect between its dialogue choices and the consequences that follow. These seemingly small instances are irksome on their own, but when it seems to be a pattern for each episode it goes from grievances to a running theme. Beyond Peter’s flashback, another, less significant fallout happened with Drax, who I apparently made angry by allowing Mantis, the empath capable of reading and altering people’s emotions, to use her abilities on him without any sort of hint that this was a problem. I’m finding it’s getting more and more difficult to manage all the relationships in Guardians of the Galaxy when there seems to be a constant lack of transparency about how these people feel about my decisions until after the fact, and the established dynamics seem fluid in order to manufacture isolated episodic drama. 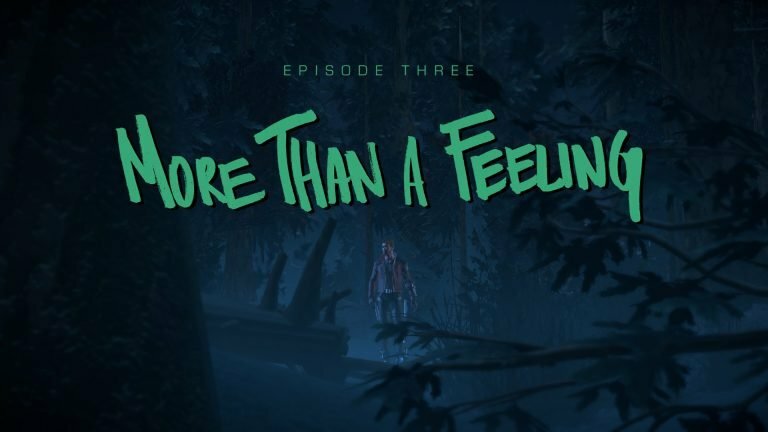 For what it’s worth, More Than a Feeling is probably the best written individual episode of the series so far. 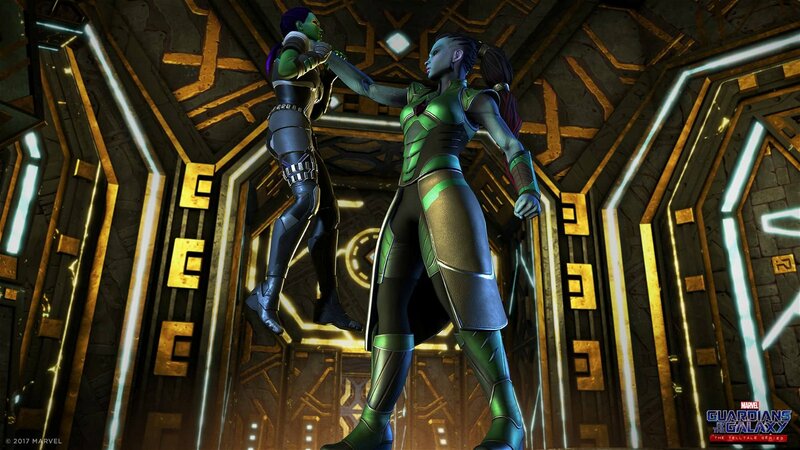 Like Rocket in Under Pressure Gamora and Nebula see the spotlight put on them in this episode. The circumstances around the their falling out, primarily orchestrated by their father Thanos, made for some of the more coherent storytelling the series has seen so far, and can be resolved in different ways depending on choices. I opted to urge the two to reconcile, and it felt like some of the tiresome in-fighting between the group reached an end befitting of the strong characters these Telltale versions are based on. 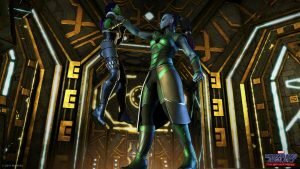 Mantis’ presence seems to be helping to do away with the trite fighting between the group, as her sensitivity to emotions means she urges the Guardians to actively search for solutions instead of brooding and fighting. 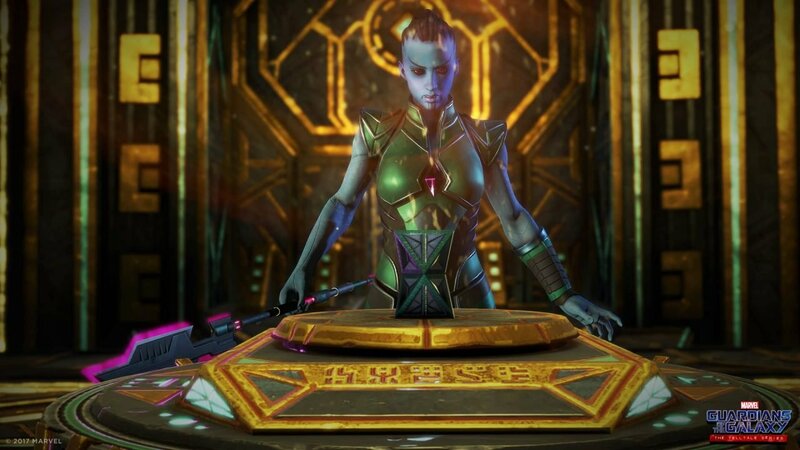 Her arrival does bring the primary conflict—using the Eternity Forge to revive their loved ones—to a head at the end of an otherwise slow-moving episode, but her role among the group does seem to be a positive one, even if her being a mediator seems to be coming far too late to salvage some dynamics. On the action front, Guardians of the Galaxy still feels hindered by stiff animations and the game’s generic art style—as I’ve mentioned in previous reviews. It was especially noticeable during Gamora and Nebula’s flashback scenes, where the action felt comical in some places and both under and over expressed. Later scenes against main antagonist Halla and her Kree soldiers felt messy and hard to keep track of, as group-wide fight sequences had me controlling several members of the Guardians at once. Even in the action it still feels like Telltale is struggling to handle this group of characters in a way that feels cohesive and well-defined. With each passing episode, I’m getting more and more conflicted about how I feel about Telltale’s take on Guardians of the Galaxy. In terms of humour and character dynamics More Than a Feeling” is the best episode thus far, but it’s still falling into the same traps that the previous two episodes did. The visual style remains indistinct, the action is handicapped by off animations, and there’s still an inconsistency to the writing and choices that often makes the game’s dialogue frustrating to play through from a strictly mechanical sense. Telltale games are supposed to adapt to the way you play and the story is supposed to be shaped by what you do in it, but we’re three episodes in and I keep feeling like I’m fighting the story the game wants to tell instead of it letting me nudge it any given direction. More Than a Feeling drags as it attempts to salvage some characters, but can’t overcome some of Guardians of the Galaxy’s lack of clarity and visual flair.